We have spend the last five weeks going over the book in the Bible this verse inspired, the Book of Acts. I think it only fair to take a moment to talk about it just a little more for some of you that haven’t been able to join us. Jesus has told us to go to all nations and make disciples, and what we found for the first 5 chapters of the book of Acts is the disciples didn’t exactly hear what Jesus had to say correctly. 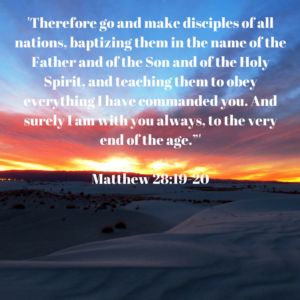 Sure, they were making disciples, but only of those people who were actively coming to them in Jerusalem. It wasn’t until after we saw the stoning of Stephen that we saw the church start to take the gospel elsewhere, and get this, it wasn’t by choice, it was because they were running scared for their lives. Eventually, though, they took the message of Jesus to the gentiles and to all the places Jesus had called them to go, but for some reason, we much like the gentiles have started to stay in Jerusalem. We believe for some reason those outside the church, that don’t know him as their personal Lord and savior are supposed to come to us and get to know him. We have failed to live out the great commission and take it to the world. We have to be willing to take the message of what Jesus has done in our lives to all of those places in the earth we would never dream go. For some of us, that may just mean taking the message of the gospel to our co-worker. Well what would they think? What if they aren’t receptive, what it they think I am crazy? Chances are if God has laid on your heart to share he is already working in those people’s lives and helping them to be more receptive to the gospel. The message of Jesus will not move forward without people who are willing to share. Who can you share with today? Who is God putting on you heart to share with?